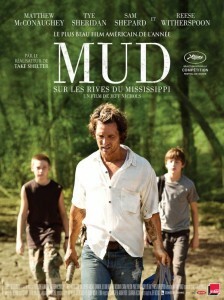 Two kids in rural Arkansas stumble across a fugitive on a river island and vow to help him. That fugitive is Mud, brilliantly played by a chip toothed McConaughey who really does get better with each year and every role. Mud could not have worked without a spot on performance from the kids and Ty Sheridan delivers. Time to get excited about David Gordon Green’s upcoming Joe where Ty costars with Nic Cage. The characters in Mud are as rich and as fleshed out as you would expect to find in a good book and the story plays out naturally and with a near perfect pace. I’d be a fool not to mention Michael Shannon’s comically charged and more than a cameo appearance. Not a ton of laughs and the troubling fact that I can’t remember a line from a nonwhite actor are the only things that detract from this very strong story. With hints of Forrest Gump and more than a reminder of Sling Blade, Mud is in the same league as both. We need more movies like this. Posted on Friday, May 3rd, 2013 at 1:52 am and is filed under Reviews.